We ran into Whole Foods for just a few items yesterday afternoon, and as I was zipping through the produce section on the way to the back of the store for eggs, an item low on the refrigerated shelf caught my eye—fresh banana leaves. I had never seen them for sale either fresh or frozen, and I couldn’t resist picking some up. They immediately made me think of fish en papillote, so I picked up a fillet of turbot for last night’s dinner, and sat down with the computer to research cooking methods. 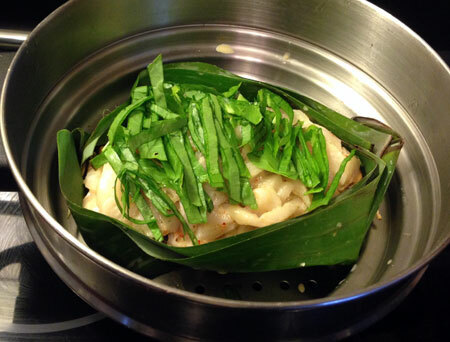 Amid recipes for grilled or baked fish simply wrapped in banana leaves, I ended up choosing a somewhat more challenging dish called Cambodian-style amok fish, in which the fish is thinly sliced and steamed along with veggies and a curry-scented coconut custard in a handmade banana leaf boat. A little wonky, but it evened out once I filled it with fish and veggies! My banana leaf boat did not come out looking quite like the ones in the photo because it was a little hard to see the initial fold in the instructions, but I managed something passable that successfully held all of the ingredients without leaking. The plan had been to make one boat per portion, but I could only fit one at a time into my little steamer basket, so in the end I loaded it down with a double portion and called it good. You can’t see the layers at all, but there was shredded bok choy on the bottom, followed by tiny whole cinnamon cap mushrooms, sliced shiitake mushrooms, and thinly sliced red onion and Swiss chard stems; on top of that I piled up the sliced turbot. The coconut milk custard poured over top was seasoned with red curry paste, fish sauce, and julienned whole fermented Key lime, and I garnished the lot with some julienned sorrel from my garden. 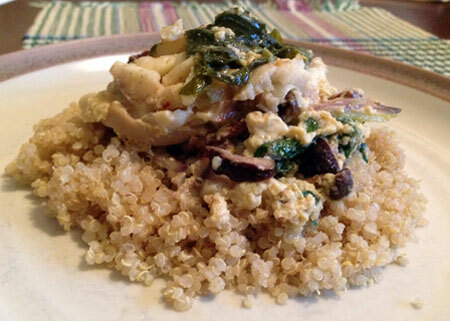 I let my banana boat steam for 20 minutes, and then served it up with a side of quinoa. I would have liked to leave it in the banana leaf for dramatic presentation, but I couldn’t quite figure out how to remove it from the steamer intact—oh well! It tasted very good, and the little bites of fish and veggies were just Theo’s size, although he may have been even more enthusiastic about his first taste of quinoa. Jeremy said he could taste the flavor imparted by the banana leaves, but I am still recovering from a minor cold and it was lost on me. The other aspect that left me scratching my head a bit was the custard, which was almost undetectable—maybe I should have doubled the amount for my large boat? Regardless, it was a fun meal, and a nice change of pace. 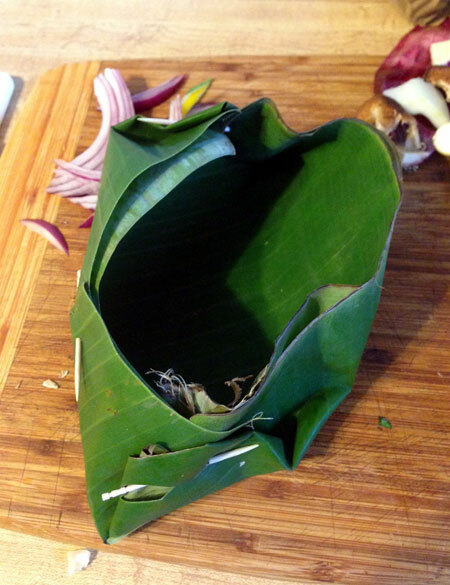 I still have some banana leaves leftover, and am thinking of lining my VitaClay with the leaves and doing a slow-cooked cochinita pibil.